Why waste plastic bottle recycling machine become more and more popular? 1). Many waste PET plastic bottles are produced every day, which causes great pollution to the environment.Recycling the waste is good for protecting environment. 2). Turn waste plastic bottles into treasures, it has a widely use. 3). Save resources and promote the development of industry. Before recycling, the PET plastic bottles are processed into PET flakes that can be reconstituted into the middle layer of the carbonated beverage bottle. The PET flakes can also be used to spin fibers into clothes, pillows, tweezers, sleeping bags, felts, etc. In addition, it can also be used as a glass fiber reinforced material because the glass fiber reinforced material has good heat resistance and mechanical strength and can be used to make automotive parts. Waste PET plastic bottle recycling machine is used for recycling waste PET plastic bottles, the complete production line mainly includes : sorting table–Belt conveyor–label removing machine–Belt conveyor–crusher–screw conveyor–washing tank–Stuff-fetching machine–hot water washing tank–screw conveyor–frictional machine–floating washing tank–Stuff-fetching machine–dehydrator machine–stock bin and packing. 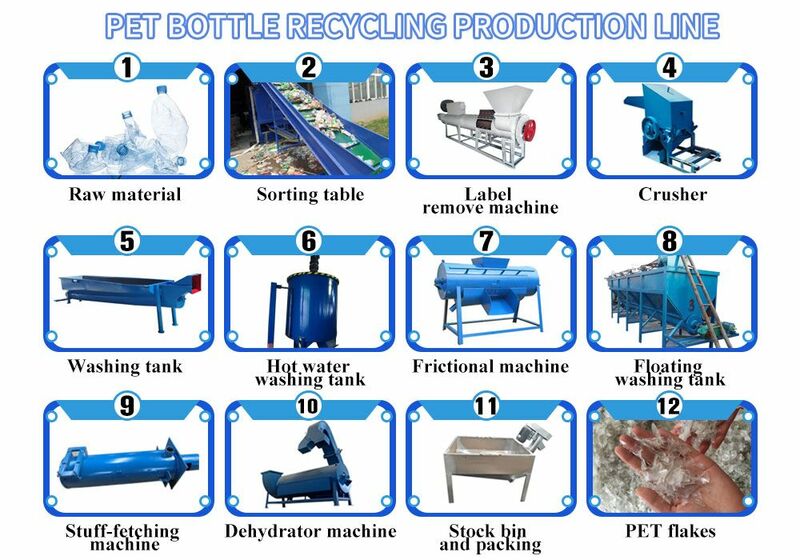 The Waste PET plastic bottle recycling machine is a regular process, we can design different production line scheme according to customers’ requirements.